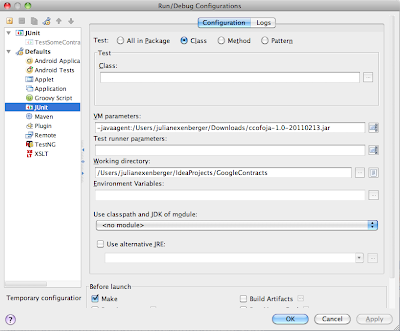 The first step after obtaining the Google Contracts for Java Jar and adding it to your project, is to enable Annotation processing support in IDEA. 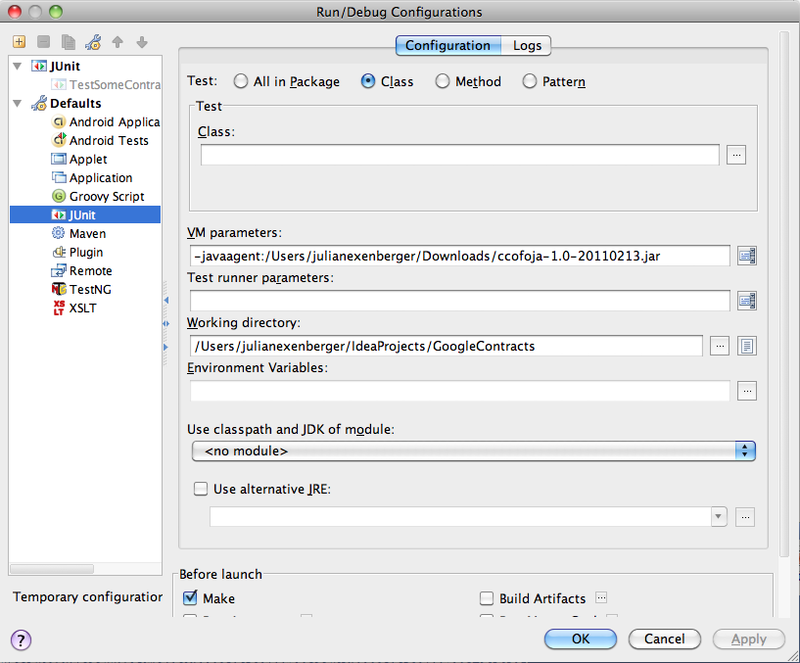 To do this go to open the Settings window (IntelliJ IDEA > preferences on Mac) and go to Compiler > Annotation Processors. 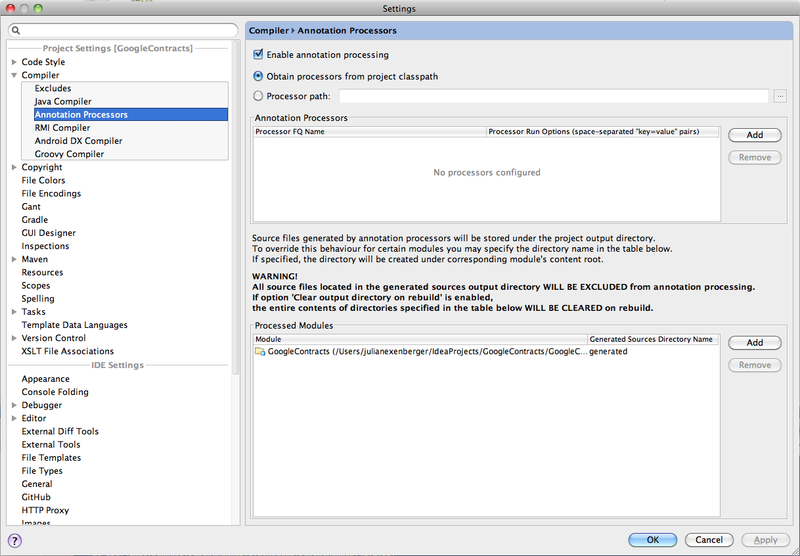 Check the Enable Annotation processing option. Select the Obtain processors from project classpath option. In the Processed Modules table click the Add button and select the Module for which you want to enable Contracts for. Hit Apply and you are ready to rock. When you build the module, you will now get a compilation failure which kinda integrates into IDEA, in that you can click on the error in the messages window and it will take you to the line that failed. Unfortunately IDEA wont highlight the line in your Editor or anything fancy like what you get in Eclipse, but it's good enough to work with. Using a class with contracts. I run the test… and... it passes! In order to actually work, Google Contracts needs to do some bytecode shenanigans in order to actually enforce the contract definitions during runtime. Currently they have two modes of operation, an offline instrumenter which is a post compilation processor which weaves in the contracts into a compiled class, and a java agent. For development the most convenient method to use is the java agent. I Also remove an existing configuration so that it picks up the new option when I run the test again. On a final note. 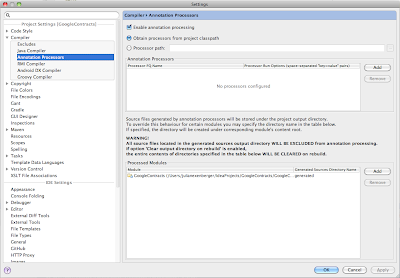 Google contracts is still pretty fresh, so here's hoping IDE support will improve if the project takes off. I must also say that I'm not too fond of the current mechanisms for enforcing the contract. Hopefully Google might take a page from Lombok and do to weaving at compile time.